guys, I created this account to seek some help, I am a master certified car mechanic, and am working on my friends 2009 yamaha big bear 250 2wd. It has a no spark/ intermmitant spark issue. 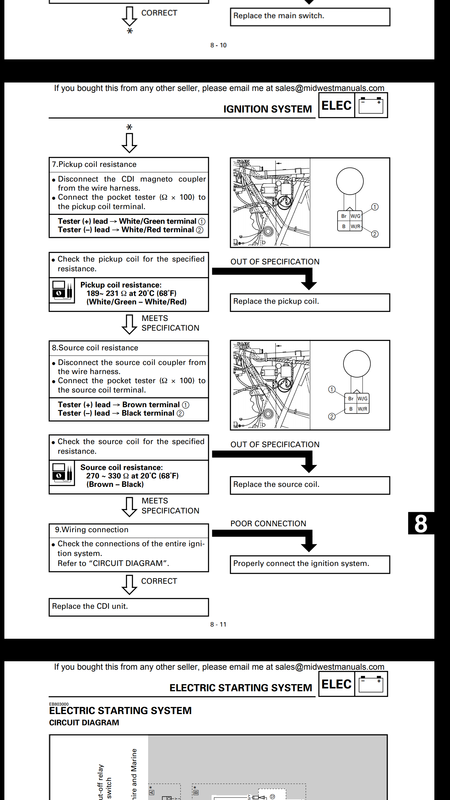 I have purchased the yamaha repair manual pdf. Now my problem is that there seems to be a discrepancy between what the repair manual says, and what wire colors actually are on the vehicle. I have called yamaha, and they were no help. Also the dealer where she bought the 4 wheeler was bought out last year, and the new dealer has no repair records. ok, so down to business. I found a bad spark plug cap, and replaced it, but I am still not getting a pulse to the primary side of the coil. According the manual the next step is to check the pickup coil resistance, and then the source coil resistance. ( see picture) the pickup coil is the w/g, and w/r wire, with a resistance of 189-231 ohms (these wires appear to be correct) and the source coil is Br(own) and B(lack) i think. with a resistance of 270-230. The problem i am running into is the source coil color of wires are not matching what is in the repair manual, so i am not sure what i am testing. 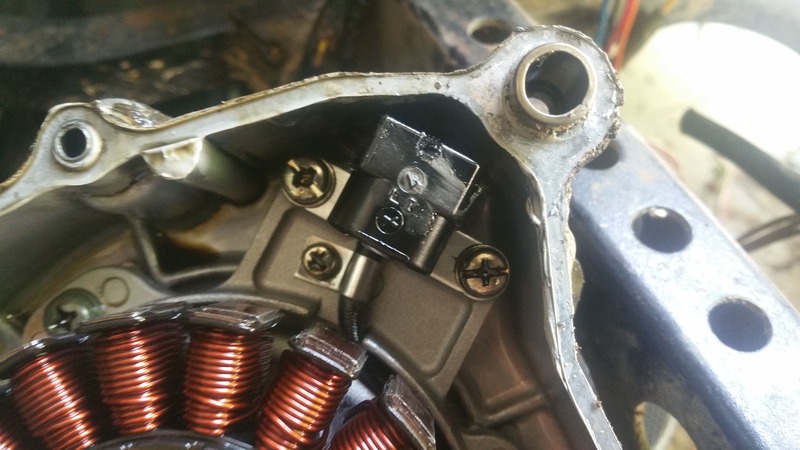 I ended up following the wires all the way into the stator housing. The w/g, and w/r wires go to what appear to be a pickup coil (see picture). in total there are 7 wires, coming from the stator housing, the w/g,w/r which i beleive are the pickup coil wires, 3 white wires, which I think are the 3 phase generator wires going to the rectifier, and lastly there is white/blue wire, and a solid red wire which I think should be the source coil (i do not know what a source coild is or does exactly nor what one is supposed to look like), but they also trace back to the stator windings, but are seperate from the 3 whites (see pictures). Also after the connector (see picture, the white blue wire now becomes a w/g wire that splices together with the other white green wire, then these wires now totalling 3, w/g, w/r, and red go into the cid. When I test the wires, the resistance to the pickup coil(?) is way high, and the resistance to the source coil(?) is about 0 ohms. Can anyone confirm, or steer me in the right direction for diagnosing this thing? I really appreciate your help. the only other question i have is that I'm not sure i could truly confirm that this is a 2009 model. It says it is on the emissions sticker, and the vin on the title says it is, but no where on the frame could I actually find a vin stamped, any help with this is also appreciated. what I believe to be the pickup coil. and the connector where the w/g,w/r, w/blue, and red wires come together. Last edited by flowershin5; 05-14-2018 at 04:33 PM. well i am not a big bear pro but i think you are right on your guesses. in general the exact number is not super critical but a zero is bad it means that it is shorted and need replaced no mater if it is the source or the pickup and since all thee come as a unit it makes it easy. 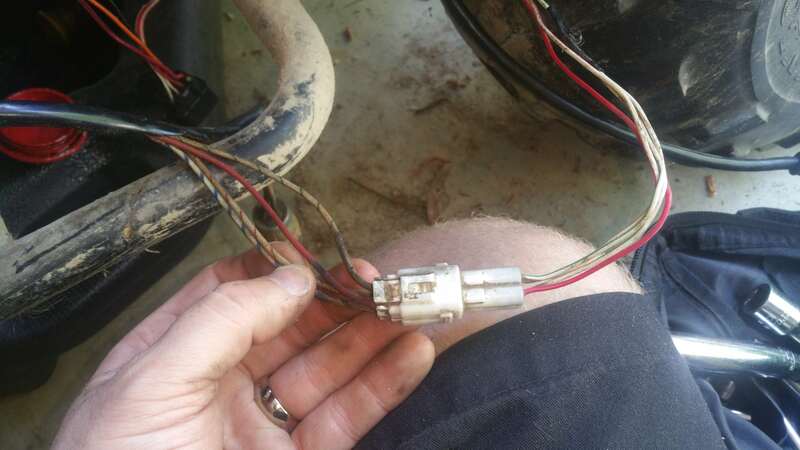 if you have checked all of your grounds and ruled out any shorts the stator and pickup is a good choice. unless it has had some sort of jolt it is probably not the cdi. and if the number is way out of spec i think you are on the right track. ok thanks, it appears that this forum is dead.